Bear Lodge Multiple Use Assocation v. Babbitt and Cheyenne River Sioux Tribe. The Becket Fund for Religious Liberty (n.d.). Retrieved from https://www.becketlaw.org/case/bear-lodge-multiple-use-assocation-v-babbitt-cheyenne-river-sioux-tribe/. Bear Lodge Multiple Use Assocation v. Babbitt and Cheyenne River Sioux Tribe. (Apr. 04, 2019). 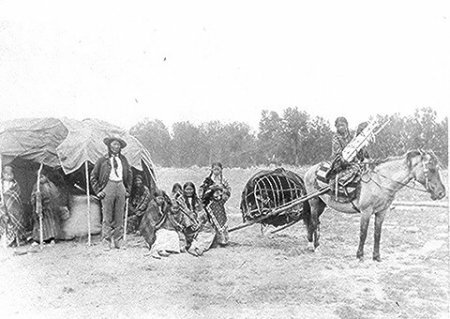 https://www.becketlaw.org/case/bear-lodge-multiple-use-assocation-v-babbitt-cheyenne-river-sioux-tribe/. "Bear Lodge Multiple Use Assocation v. Babbitt and Cheyenne River Sioux Tribe." The Becket Fund for Religious Liberty. Accessed [Apr. 04, 2019]. https://www.becketlaw.org/case/bear-lodge-multiple-use-assocation-v-babbitt-cheyenne-river-sioux-tribe/. Several Native American tribes, including the Cheyenne River Sioux of Wyoming, had worked with the National Park Service to make arrangements to practice their ancient Lakota rituals undisturbed every June on sacred grounds at Devil’s Tower National Monument in Wyoming. The area also happens to be quite popular for rock climbers and visitors, so the Park Service implemented a sensible plan that discouraged rock climbing during June, posted signs marking the sacred ground, and started a cultural education program that informed visitors of Native American culture and religion. But a group of climbing guides sued the Park Service, arguing that the efforts unconstitutionally made the Lakota religion an official state religion in Wyoming. Becket, along with a group of civil liberty and religious organizations, fought back with an amicus brief on behalf of the tribe. The Tenth Circuit Court of Appeals, dismissed the case, finding that the climbers had failed to identify a personal injury and consequently had no standing to bring the case. Cases like this are important because it is admirable when governments make a conscientious effort to protect religious minorities. Yet the same arguments used by the climbers, while seemingly absurd, are used to challenge studying religious texts in high school history or English classes, or exhibiting religious elements in local cultural festivals and displays. But the religious aspects in our culture and history are what make our society great. Cheyenne River Sioux Tribe (Steven Emery, Thomas J. Van Norman), the Indian Law Resource Center and the Law Office of John Schumacher, LLC represented the tribes.